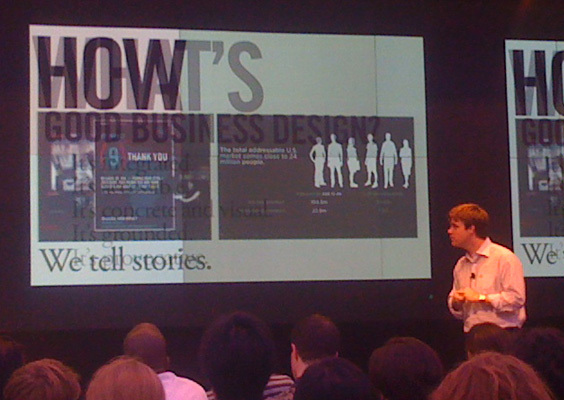 Duane Bray and Ryan Jacoby of IDEO spoke last night at an IxDA New York event. The venue was Bloomberg HQ on Lexington and 59th. In case you are unfamiliar with IxDA, it’s the grassroots equivalent of a professional organization for interaction designers. The website serves as a forum to pose questions and answers. The group organizes great talks by influential people who are broadening the understanding of what interaction design is. This was the first event I attended and I’m glad I went for a few reasons. 1. I got a glimpse inside the Ceasar Pelli designed Bloomberg building – an overpowering but exciting onslaught of information design and a great example of an open plan office. 2. The food was great. 3. I bumped into at least 4 other faculty from the Design&Management Department at Parsons. It was great to see that they care about their subject and attend events like this. 4. The talk was fun and pretty inspirational in a very pragmatic way. The IDEO process of combining business people and designers on one team in order to create a market ready product just makes a lot of sense, so no surprises there. - Consumers expect a conversation with brands not just a monologue.